The critics’ reaction to Robert Lepage’s new production of Die Walküre at the Met leaves this contrarian reviewer in something of a quandary. Not only was pretty much everybody underwhelmed, but there was a consensus about what (they thought) was wrong: the clunkiness of The Machine, the lack of poetry in the latter part of the first act, the clumsy path to the final tableau. No, one doesn’t want to just heap on the contempt, but at the same time it’s not easy to build a case for Lepage’s invention thus far in the Ring. There are some striking images, though that’s in the sense of snapshots, frozen instants, rather than dramatic beats. That last glimpse of Brünnhilde (or, rather, her body double) handing upside down from the cliff face, magma bubbling around her, is spectacular eye-candy, but, to be frank, it actually looks better in a photograph than it did in real time, at least from where I was sitting. Or, to put it another way, that final image looks like a very expert realization of a concept sketch; the problem is, the concept sketch is only tangentially related to what we generally think is supposed to be going on in the scene. Yes, there’s a woman in armor surrounded by magical fire (sort of) but the emotional sense of the last few moments is confusing. Er [i.e., Wotan] streckt den Speer wie zum Banne aus, dann blickt er schmerzlich auf Brünnhilde zurück, wendet sich langsam zum Gehen und blickt noch einmal zurück, ehe er durch das Feuer verschwindet. – Der Vorhang fällt. Of course, there are ways to “disappear” that don’t involve a walk through a simulated wall of flame. 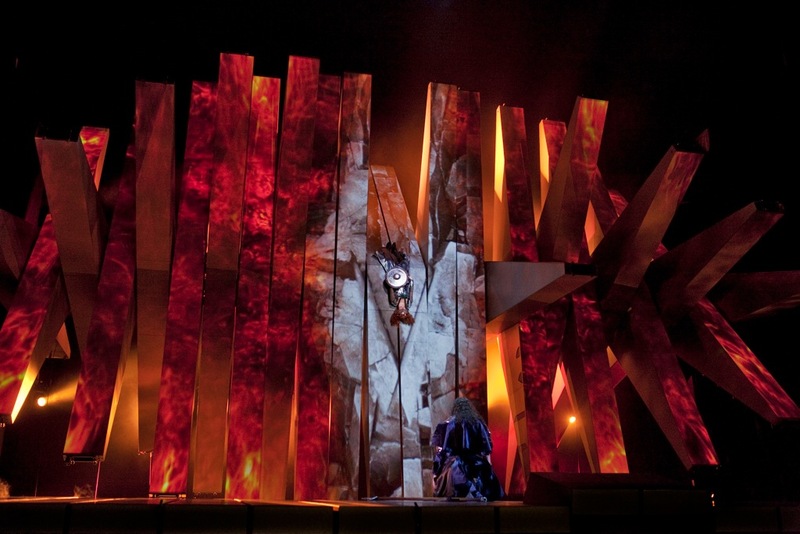 For example, in Phyllida Lloyd’s 2004 production for the English National Opera, the Wotan exited the stage down a flight of escape steps leading to the auditorium, passed through the front row of orchestra seats, and then departed up the main aisle of the theater. But the essence of the scene was intact: Wotan in motion, distancing himself from his abandoned daughter. Contrast this with what happens in Lepage’s production. Having set the body double in place, Wotan (Bryn Terfel) climbs down the inclined rock face to the downstage “deck” area of unadorned planks. 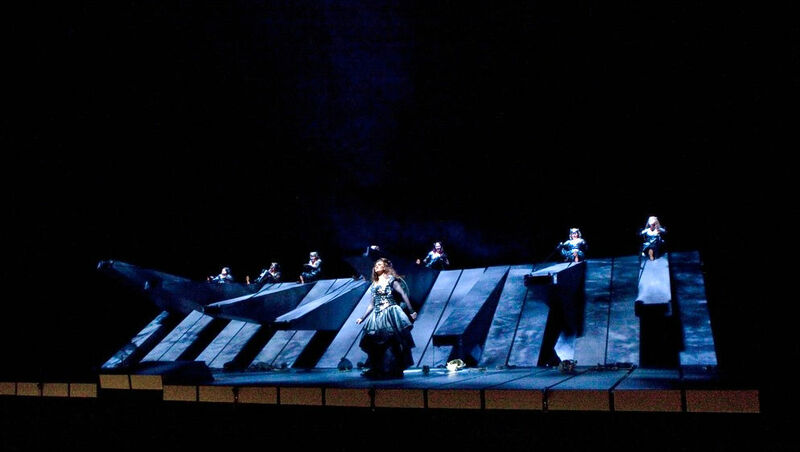 The Machine pivots until “Brünnhilde” is hanging head downward, leaving Terfel to sing his last line and then… kneel, facing upstage, immobile, until the curtain descends. 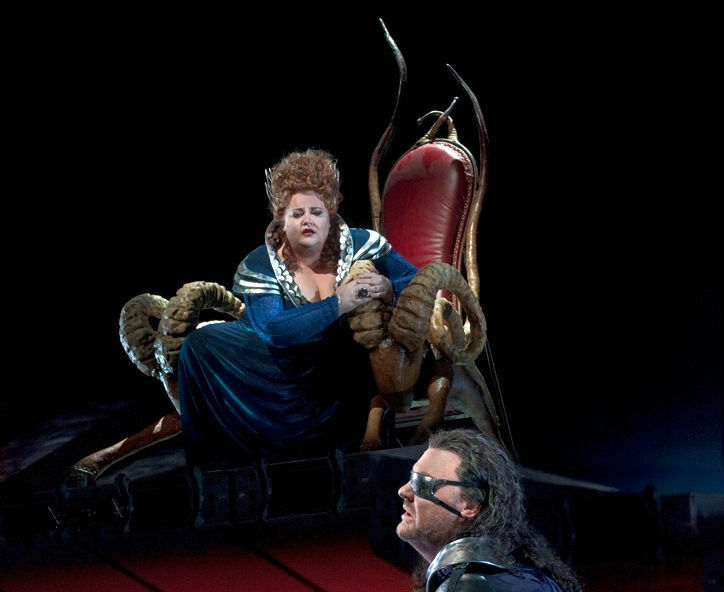 So are we to assume that Wotan intends to stand guard on Brünnhilde himself? Or is Lepage suggesting that Wotan is now completely broken, incapable even of making a dignified exit? Or is the problem simply that there is no safe path offstage, and Terfel prefers not to end his performance as his leading lady Deborah Voigt began hers, with a Machine-induced pratfall? The curious thing is, that non-exit was practically the only moment in the entire production that diverged from the canonical. Siegmund and Sieglinde met in a hut built around a tree impaled on a magic sword, Brünnhilde yodeled her “Hojotohos” in a corselet of steel plates and a silk bustle, and Fricka arrived upon a ram-impelled vehicle—though, to be sure, what Stephanie Blythe rode didn’t resemble a chariot so much as as a high-end mobility scooter. So the issue here is hardly infidelity to the letter of the accreted tradition of Ring presentation; rather I see two main and perhaps insurmountable stumbling blocks with Lepage’s treatment: lack of understanding of deeper meanings in the work, and sheer clumsy stagecraft. Of course, when we do get to the meat of Siegmund’s backstory, Lepage doesn’t leave that alone either. As the hero relates his woeful history, the planks of the Hut begin to shimmer in the firelight and then projected shadows act out the narrative. The problem is: the shadow play doesn’t offer us any additional information or emotional insight, and, for that matter, they distract attention from the text. Even worse, some of the younger Wagnerians present couldn’t help thinking that the director borrowed this visual device from a very different treatment of the hero myth. Lepage varies this gimmick to punch up another narrative in the second act. During Wotan’s great monologue, a giant eyeball materializes out of the mountainside, and a sort of PowerPoint presentation ensues, offering the listening Brünnhilde visual aids to help her digest his bullet points. But again, when you have Wotan singing text about the Ring, while the orchestra plays motifs associated with the Ring, how much added informational value is there in projecting a movie of a twirling ring onto the giant eyeball? Again, information is not the point here. Those of us who have attended Das Rheingold at some point in history have already seen the Ring stolen, and everybody else should have read the program. What we should be noticing is how Wotan retells the familiar tale, what spin he puts on it, and how he is emotionally affected by recalling these events. Even the “new” sections of the narrative, e.g., Brünnhilde’s origin, are less reportage than reminiscence. But even the searing emotional impact of “Der Welt weisestes Weib gebar mir, Brünnhilde, dich…” is blunted when father and daughter loom 20 feet apart on opposite sides of a giant eyeball. Every director adds the occasional questionable frill, but Lepage compounds the problem as he seems to have put little time or thought into the music drama’s most important scenes. The opening of the door in Act 1, so evocative of the letting down of emotional guard of the soon-to-be lover, amounted to nothing more than a hideous chartreuse floodlight glaring on the cyclorama. Even worse, the dramatic core of the opera, the “Todesverkündigung,” felt flat and tentative on opening night. For the apparition of Brünnhilde as herald of death, Lepage simply sent Voigt walking on from the stage right wing, leaving her downstage of Jonas Kaufmann (Siegmund.) Thus in order to face the doomed man, the soprano had to turn upstage, then cheat back out in order to get her voice into the auditorium. The whole long scene had to play out on the narrow “apron” planks sing the Machine, the only part of the set that offered a variation of level, was in “wall” formation, indicating the edge of a forest. And so these two artists, both of them singing their roles for the first time ever, were hung out to dry: just standing there, without blocking. Act 2’s final melee was a mess, a lot of incomprehensible flailing among disco strobes, with Voigt having to pass directly in front of Terfel to retrieve the broken sword pieces and to carry off Sieglinde. All Terfel could do was to try to look away and pretend he didn’t notice a red-headed woman in shiny armor less than six feet away on a brightly-lit stage. No wonder Lepage brought in the act curtain a good thirty seconds too early: he was completely out of ideas! Even when the ideas themselves were solid, the execution suffered. The Machine in “rostrum” formation shakes and creaks when singers walk on it. Voigt stumbled on the Machine at the prima; a few nights later, another Valkyrie got dumped into the trench separating her seesaw “horse” from the apron playing area. Blythe’s motorized throne jumped a rail on her first entrance, and then, once she backed off at the end of her scene, the stage elevator took forever to get her off stage, all of which time Fricka presumably would have overheard Wotan’s confessions to Brünnhilde, had the audience’s giggles not drowned out most of the scene. One night the sword failed to appear in Hunding’s hut and a stagehand had to sneak out and insert the fateful weapon so the plot could continue. And, of course, there was the situation on the afternoon of the worldwide HD simulcast, where hundreds of thousands of people were kept waiting in the dark for the better part of an hour while technicians swarmed over the Met stage dehydrolizing the frammistan or whatever it was. Stuff happens; we all know that, and audiences generally are pretty tolerant of recalcitrant technology—that is, when they’re emotionally invested in a production. Sadly, Lepage’s Ring (thus far) seems to lack the heart necessary to overlook its shortcomings. This entry was posted on Thursday, May 19th, 2011 at 1:46 pm	and is filed under Rough and Regie. You can follow any responses to this entry through the RSS 2.0 feed. Both comments and pings are currently closed.